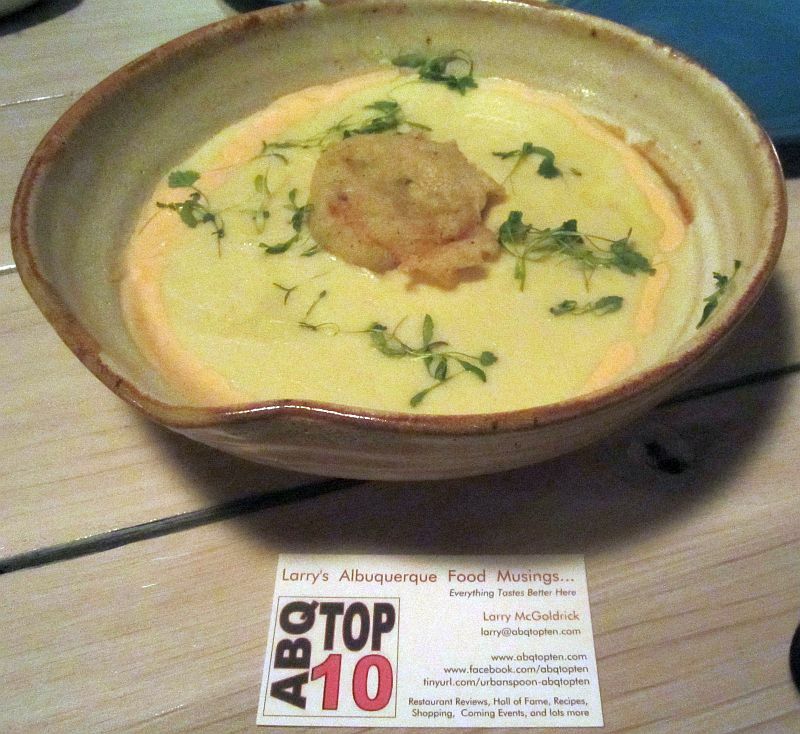 2012 was a good year for outstanding dishes in Albuquerque and in New Mexico. I have put together a list of my favorites. They are in random order. Two new restaurants deserve special mention. 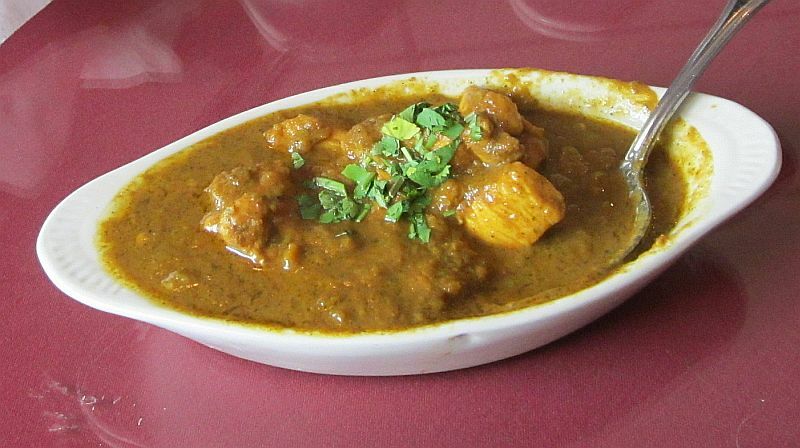 Paddy Rawal’s OM is an Indian restaurant on Fourth in ABQ, and in its two months of existence, has drawn a loyal (and raving) collection of fans. OM was awarded my Best Newcomer of 2012 Award for ABQ. Deservedly so. In Arroyo Seco, just north of Taos on the way to Taos Ski Valley, I found Aceq, a tiny place that serves some on the best food in Northern New Mexico. This is inventive, farm-to-table stuff, and I have awarded Aceq my coveted Best Newcomer of 2012 Award for New Mexico (outside the Duke City). Both places are superb. Go to both of them, and often. Mexico’s Sesquipedalian Sybarite. 724 Restaurant Reviews, More Than 4000 Visitor Comments…And Counting. 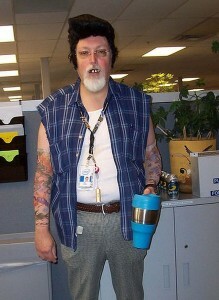 Gil and friends have also weighed in with some of their favorites. They appear in a string of comments on his blog Gil’s Thrilling (And Filling) Blog, which you should read every few days. To see his list and other users lists n the Comments section, you need to scroll around near the bottom of the page. 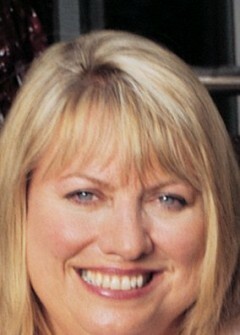 Cheryl wears many hats:author, food and travel; culinary tourism consultant, and registered fiidie. 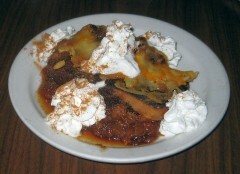 She is a Contributing Culinary Editor, New Mexico Magazine. She lives near Santa Fe, so her list is somewhat biased toward that area. No matter. Pay attention because she really knows what she is talking about. You will feed yourself quite well by following her recommendations. 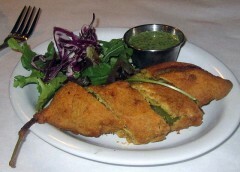 Here is her list for 2012–The 10 Best Things I Ate in New Mexico This Year. Surely more such lists will appear shortly, and I will link to them on this page. Ok. Here we go. Remember, random order. Think of a Samosa. 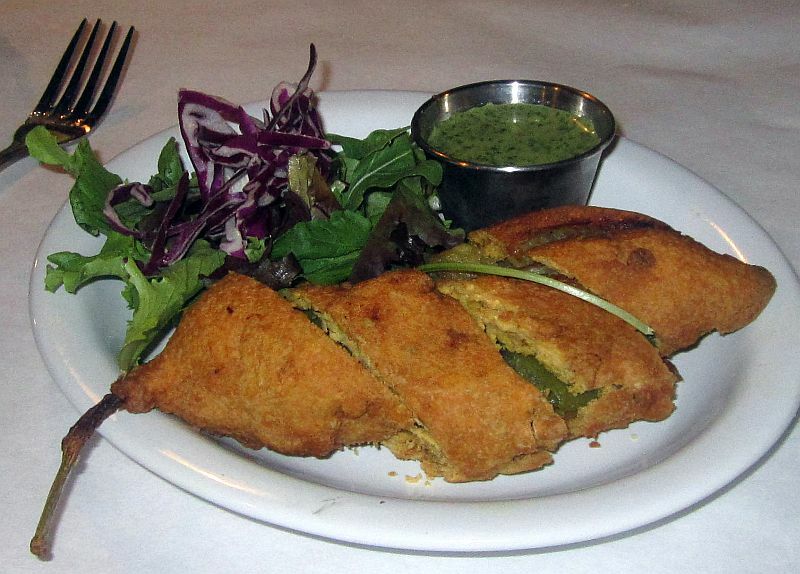 Noe imagine the stuffing (peas, mashed potatos, and spices) stuffed inside a tasty poblano chile, and immersed in a gluten-free chickpea flour batter, and gently fried to a crispy golden brown, and You will have dreamt up Paddy’s Stuffed Poblano This is Indian-New Mexican fusion at its very best. It is served with a smattering of very fresh field greens and a slightly acidic sauce-dressing containing coriander leaves. Pour this dressing on the greens and the poblano. This is an utterly amazing taste treat. I could easily make a fine lunch of these gems. Chicharrón (Spanish pronunciation: [tʃitʃaˈron], Portuguese: Torresmo [tuˈʁeʒmu], Filipino: chicharon, Chamorro: tsatsalun) is a dish made of fried pork rinds. It is customary in New Mexico to make these from small cubes of pork belly fried to a semi crispy state, and fans often eat them like peanuts pop a few in your mouth. Bet you can’t stop. ACEQ’s version is like no other that I have had. The cubes are larger (about an inch) and they are not fried to a dry crisp, but remain tender and juicy. They are served here on a bed of butter lettuce and topped with a delicious sweet rep pepper relish. Outstanding appetizer, and a fine start to a great meal. 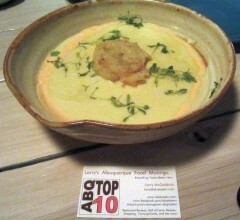 There is quite a surprise lurking in this fine bowl of soup: a crab fritter. I am a sucker for crabmeat in almost any form. It is very special here. The soup itself is very rich and flavorful. The sweet corn taste is complemented with a dollop of spicy yogurt. This is a soup for the gods. Better than anything I have tasted at Roadrunner Foodbank’s Souper Bowl. This dish is most often called Eight Treasure Duck. 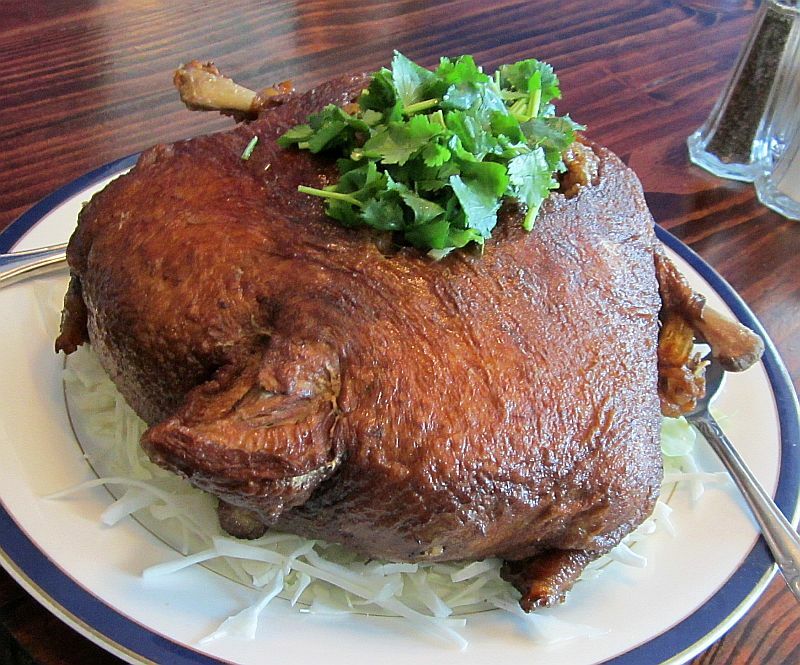 This is a boned duck large enough to feed 4 – 6 hungry diners. It is rubbed inside and out with Chinese five spice mixture and salt. It is stuffed with a savory mixture of glutinous rice fortified with such (but usually not all) ingredients as cooked rice, dried Chinese or shiitake mushrooms, walnuts, fresh lotus nuts (or gingko nuts), Chinese sausage, minced Yunnan ham, green peas, diced carrots, spring onions, coriander leaves, p oyster sauce, sesame oil, and Salt and pepper to taste. This is the most spectacular dish I have had at Budai. The star of the evening was my Osso Buco. Osso Buco is Italian for “bone with a hole” (osso bone, buco hole), a reference to the marrow hole at the center of the cross-cut veal shank. It is traditionally server with or finished with gremolata, a chopped herb condiment typically made of lemon zest, garlic, and parsley. 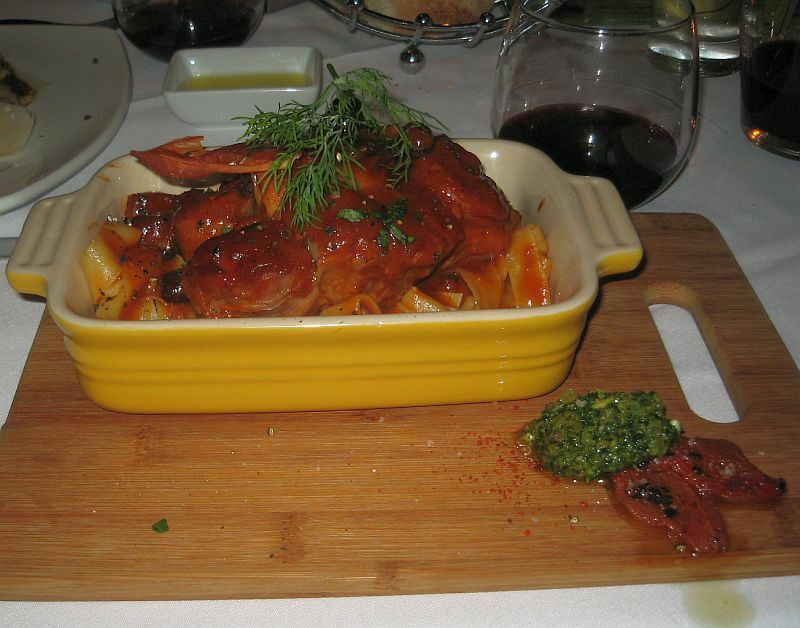 It is a traditional accompaniment to the Milanese braised veal shank dish osso buco alla milanese. Maxime presents this in a small rectangular casserole with the veal shank atop scratch-made pappardelle, a semolina pasta in the shape of flat sheets about 1-cm. wide. 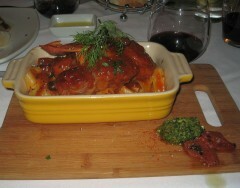 The gremolata and a dollop of petal of confit tomatoes appeared on the plank holding the casserole dish. Mix the gremolata into the thick braising sauce, if you will (I do). I have been eating (and making) osso buco for more that a half century, and have never had any better than Maxime’s. Tender and juicy, this shank was perfect. Don’t forget to eat the marrow (ask for a marrow spoon). Capirotada (pronounced: kä-pē-rô-tä-thä) is a common Mexican bread pudding that is traditionally eaten during Lent. As many of you already know, I am a bread pudding freak, an affliction that I share with Gil Garduño (who put me on to thus dish). Well, I indeed had this on Good Friday. Cecilia’s version was made from bread that she baked that morning, and she uses pine nuts instead of walnuts. This is sweetened with piloncillo, a Mexican unrefined dark sugar from cane that is usually sold in cones. This is distinctly better than using white sugar or molasses, and it has a quite delicate not-too-sweet taste. Topped with melted cheddar and other cheeses, this capirotada is a fine example of what a savory bread pudding should bd. It broke into my Bread Pudding Hall of Fame List. Two eggs over easy with rice, vegetables, house made kim chee and garlic chili sauce. 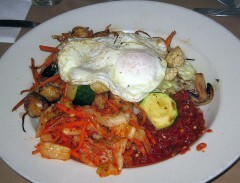 Bibimbap is a signature Korean dish. The word literally means “mixed meal” or “mixed rice.” Bibimbap is served as a bowl of warm white or brown rice topped with namul (sautéed and seasoned vegetables) and gochujang (chili pepper paste). A raw or fried egg and sliced meat (usually beef) are common additions. The ingredients are stirred together thoroughly just before eating. It can be served either cold or hot. 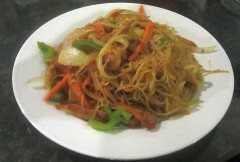 Karen’s version is served over brown rice, and she ads extra chili paste for me (some like it hot…). Unusually tasty dish that you won’t find everywhere. 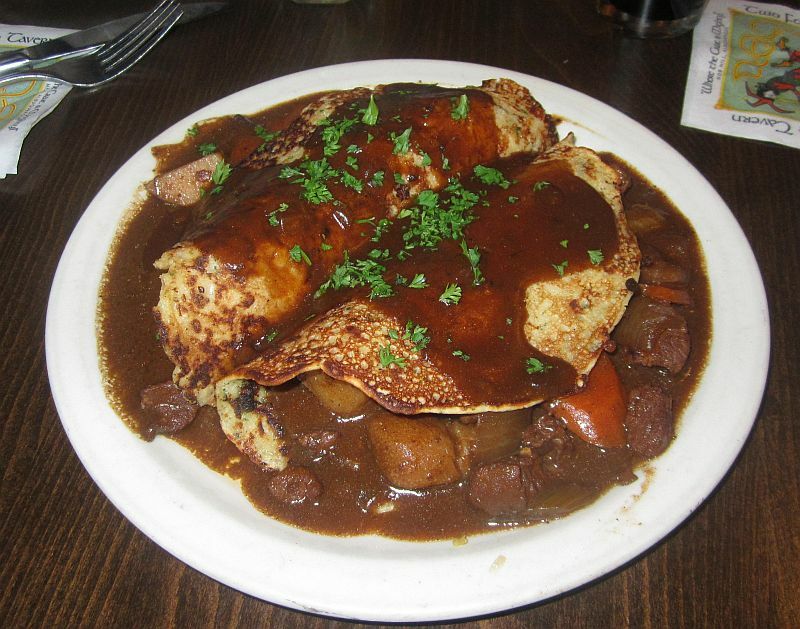 You need to try the Guinness Beef Boxty — two house made potato pancakes filled with slow simmered Guinness beef stew. 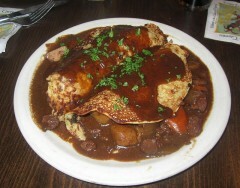 Boxty (bacstaí or arán bocht tí in Irish meaning “poor house bread”) is a traditional Irish potato pancake. The dish is mostly associated with the north midlands, north Connacht and southern Ulster, in particular the counties of Mayo, Sligo, Donegal (where it is known locally as poundy or poundies; also known as potato bread in Ulster), Fermanagh, Longford, Leitrim and Cavan. There are many different recipes but all contain finely grated, raw potatoes and all are served fried. I ate the whole thing. If you go to Farina with me, I will not share it with you. Get your own. 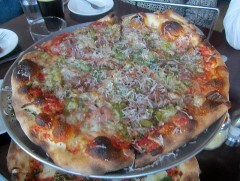 The fennel sausage is among the very best I have ever tasted. Roasting the onions before baking the pizza is a stroke of genius. 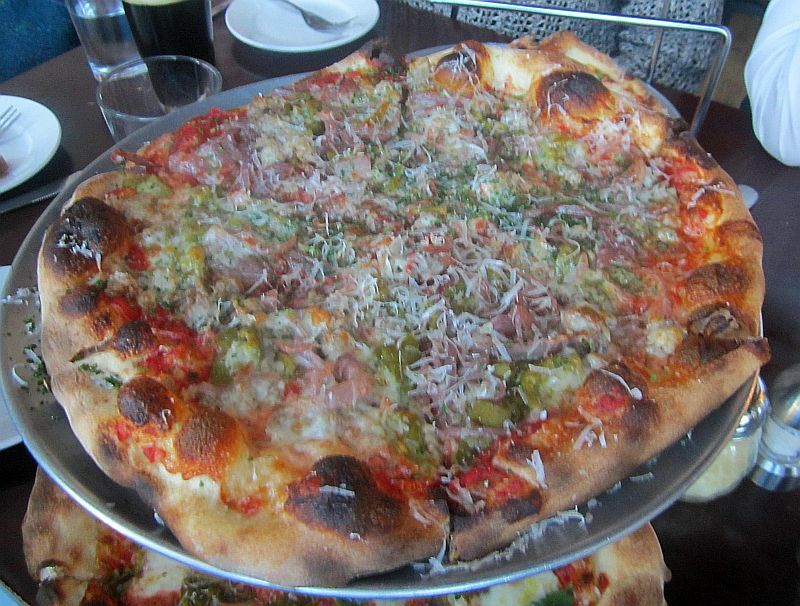 This pizza is tied with another at Nicky V’s (Tre Pizza, named after her son ) for the best pizza that I can remember having anyplace. Al Forno means baked in the oven. 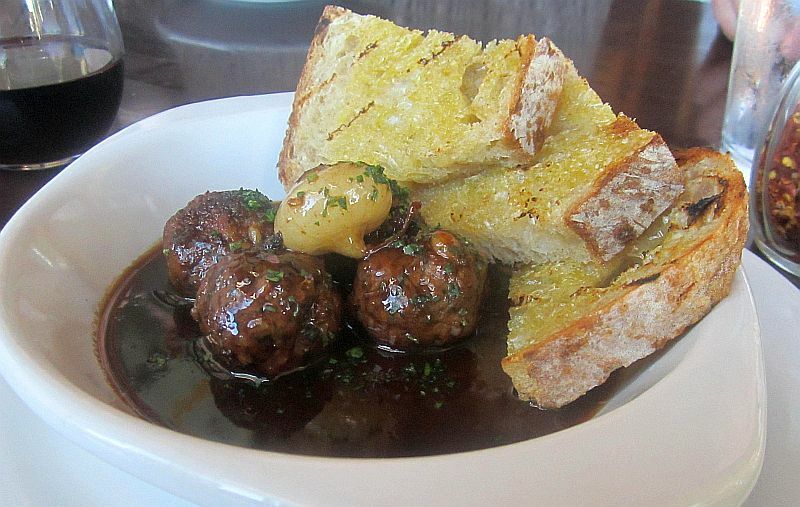 These are not the usual meatballs done up in a skillet and doused with red sauce. The meatballs are a mixture of beef, pork, and Parmesan cheese. Covered with an intensely rich and flavorful brown sauce, the dish represents the very best on Italian style cooking. The meat is very tender, never dry, and explodes all over your tastebuds. The sauce has a fantastic mouth feel. This dish is not some lame New Mexican imitation made by adding green chile to chicken stew, but a phenomenal scratch Indian curry to which fine New Mexican green chile has been added. The spice blend is stunning. This is a highly complex dish, and at the end of the year, will place prominently on my Best Dishes of 2012 List on mu blog. Thanks, Shree. You did it again. Amazing. We Nuevo Mexicanos are accustomed to having Carne Adovada slow cooked in red chile, but this panini was filled with pork, baby field greens, mozzarella cheese, and a juicy mayo-based sauce and expertly grilled on the press until the cheese hit that just melted liquid state. This is by no means a dry panini, but five paper napkin sloppy. The fillings exploded onto my taste buds. Best panini I have ever had. Anyplace. Michael tries to partner with local restaurants. He gets the carne from Gary West’s Smokehouse BBQ in Rio Rancho. Excellent choice: Gary constructs what I think is the very best BBQ in the area. I am a Singapore Noodle freak. I ate them several times each month when I lived back in Maryland at the Noodle King in Cloverly. When I came to New Mexico, it took me several years to find them here. So far, I have found really good versions at Double Dragon in Rio Rancho, China Best on the west side, and Budai Gourmet Chinese i on San Mateo. Add May Cafe to this short list. The version here is perhaps the best I have ever had. Beautifully spiced, piquant, and perfectly done. Make sure to add shrimp when you order this stunning dish. It is one of the ten best dishes I have had during 2012. Served with a smooth polenta and delicious braised greens (kale tonight). 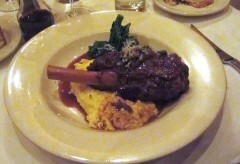 I first had these lamb shanks on my first visit in 2009. I regret having waited so long to return to this tender beauty. I picked the shank up by the bone, held it vertically, and the meat slowly slid off the bone onto my plate. The meat was fork-tender and moist — perfect. Make sure to sop up all the sauce — it is rich and complex. This version of lamb shanks is among the very best that I have had anywhere. I need to tell you about the dog. All the canonical ingredients are present and cucumber slices have been added. The doc is a ¼-lb all beef Vienna hot dog. The bun is poppy-seed encrusted, and not toasted (correct). Sport peppers, neon relish, tomatos, onions, ans yellow spicy mustard complete the huge handful. One bite, and I was transported back to Chicago, where I lived for 15 years. 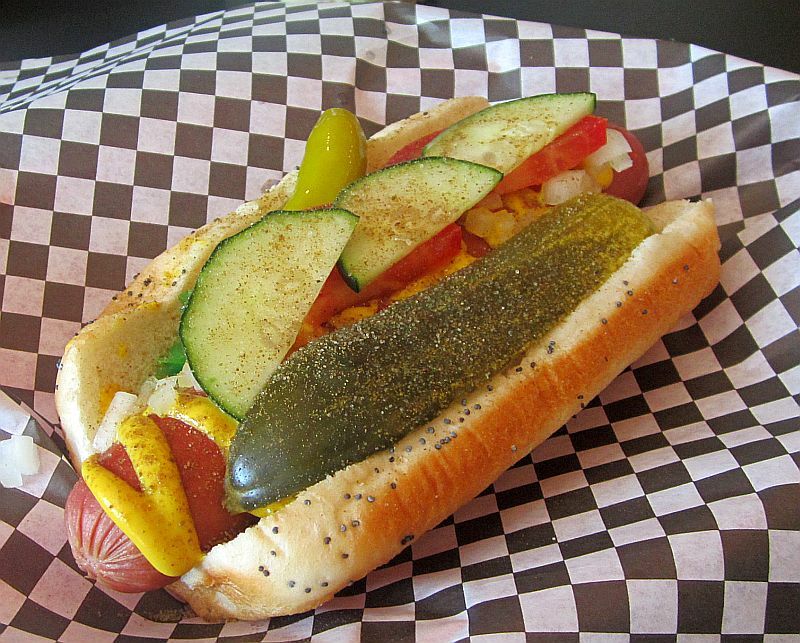 During baseball season, I would stop at Byron’s Hot Hog Haus on Irving Park almost under the Sheffield El platform, pick up a bag with really greasy (but great) fries that grease stained the white paper bag, and proceed to the bleachers to watch my beloved Cubs. Sitting in the bleachers is a hoot: Bleacher Bums would bet on anything. I would often pay for my meal by betting an unsuspecting mark that Adolpho Phillips would scratch his nuts when he came up to bat (a sucker’s bet—he always did). The dogs at Byron’s were my favorites, and these at The Chicago Dog are every bit as good. I should make my own… hmm….